In our proposal, emphasis has been laid upon the design of a modern and solemn building expressing the dignity of justice, the Council of State’s respectability within the society and its significant place in the hierarchy within the governmental institutions. 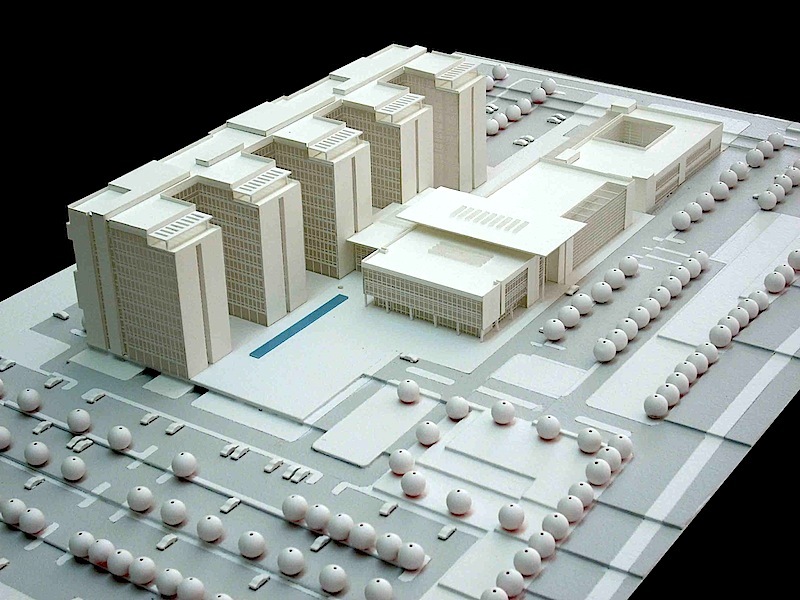 Because the site is elongated through the north-south direction, the building is placed parallel to this axis, with the main entrance organized on the western part of the site, from a planned boulevard, since entering the site from the secondary road on the west is a much better solution than using the main Ankara-Eskişehir Highway within the hierarchy of vehicular movement. From the main entrance, the Ceremonial Square is reached, where cars may drop off their passengers. 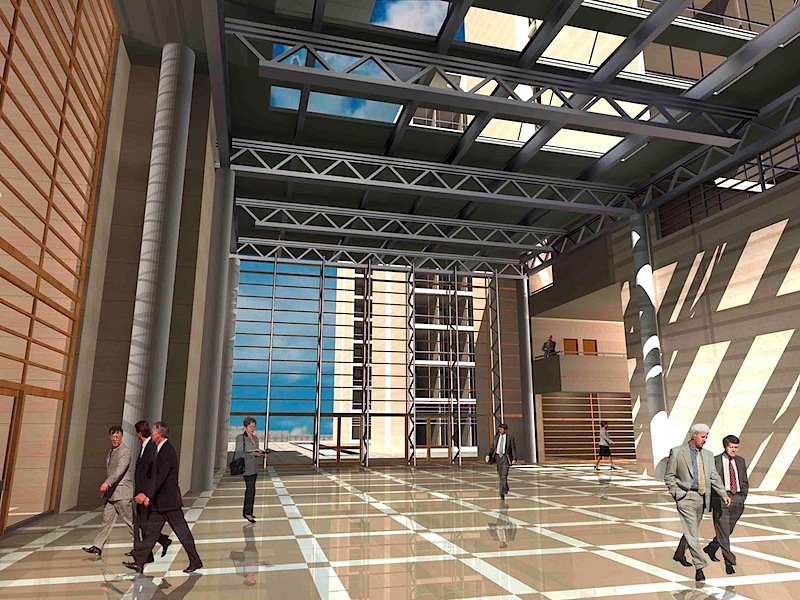 The main entrance also serves the Council of State Headquarters, Social Facilities and the Conference Hall. The southern entrance is merely for services and Medical Emergency. The President’s Office has been treated as a distinct part of the programe due to its importance and its place in the protocol. 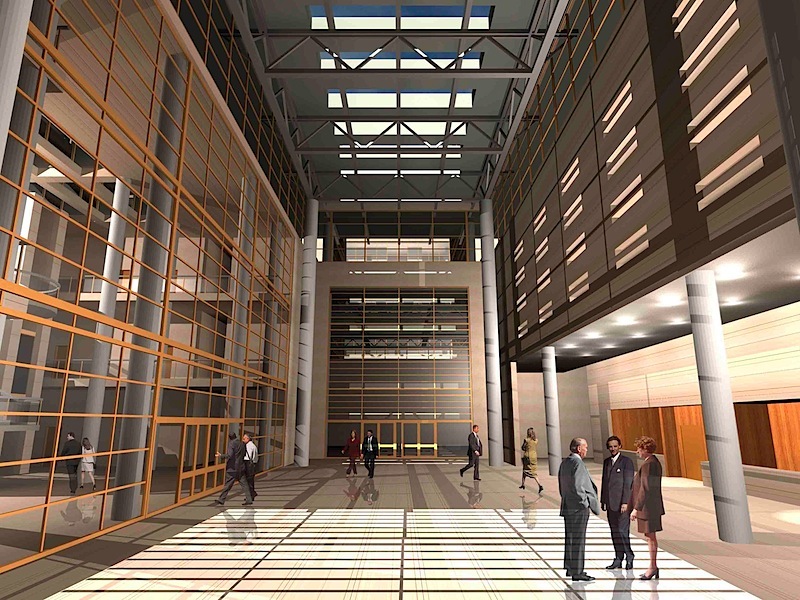 The entrance hall is not only connected to the atrium of the President’s Block, but it also becomes an extension of the Main Foyer and serves the Conference Hall. 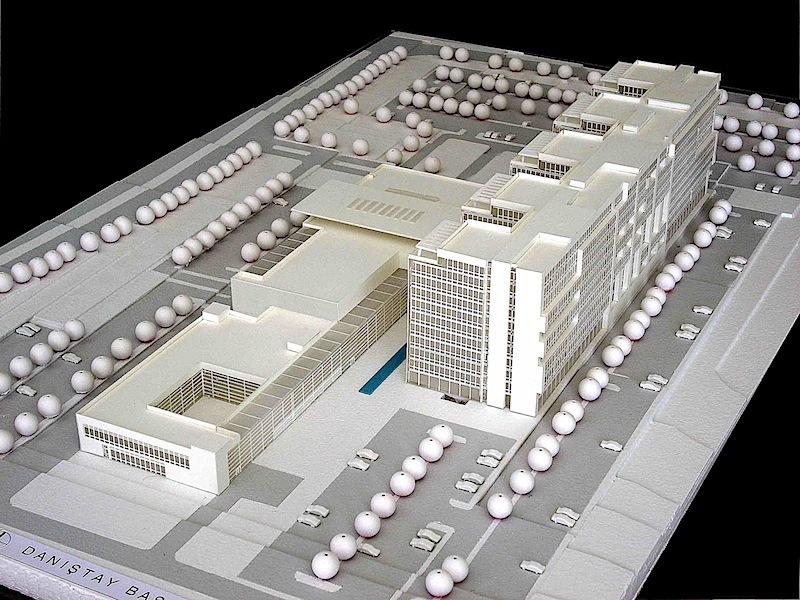 The administrative block is designed as a core with two corridors. To prevent the building from elongating and to decrease the number of stories, a circulation system consisting of the branches attached to the main spine has been accepted. The spaces between branches (courtyards) both provide sunlight and give the possibility to create visual relationship with the outside. These spaces also interrupt the length of the building and prevent the monotony of the corridors by getting sunlight and view to the interior. Additionally, these spaces are considered as suitable places for the employees to rest during work hours. In our proposal, consideration has been given for protection from the western sunlight as well. The western walls of the branches are designed as blind walls and rooms have not been placed behind the corridor surfaces facing the spaces that the courtyards create. In general, corridors have been placed behind these surfaces to decrease the undesirable effect of the sunlight coming from the west. Sun breakers have been used on these surfaces. Since the narrow facades of the complex have been placed perpendicular to the busy Eskişehir Highway, this layout also plays an important role in minimizing the traffic noise generated from the highway.